When your cruise ship docks in Mallorca’s captivating capital, gain cultural insight into the picturesque villages of Valldemossa and Palma de Mallorca on a private 6-hour shore excursion. Admire spectacular seaside scenery; explore the charming streets of Valldemossa; and gaze at the UNESCO World Heritage-listed Sierra de Tamuntana Mountain Range. Absorb panoramic vistas of Palma at the stolid Bellver Castle and see all of the city’s spectacular sights on a guided walking tour, visiting the Cathedral of Santa Maria and the old fish market. When your cruise ship sails into the picturesque Palma de Mallorca port, disembark and greet your private guide in a pre-arranged location. Relax in a comfortable, air-conditioned minibus and admire spectacular seaside vistas as you journey towards the west coast on a short drive. Arrive at Valdemossa and stroll the quaint cobbled streets with your knowledgeable private guide; see picturesque streets thronged with flower-filled window boxed and buttery sandstone buildings and visit the Royal Carthusian Monastery, a sacred 14th-century structure. Relax in an ambient coffee shop while admiring views of the picturesque mountain perimeter. After enriching exploration, begin the return journey to Palma and enjoy views of distinctive farming terraces and ancient water mills. Discover the elevated Bellver Castle and capture panoramic vistas of Palma’s coast, during a brief stop on route. 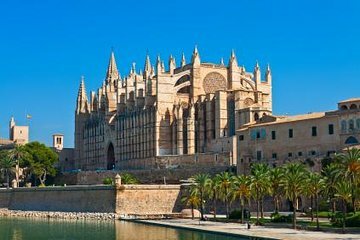 Arrive in Palma and embark upon an explorative walking tour with your informative guide; visit the Royal Palace of the Almudaina and the Cathedral of Santa Maria in order to admire their architectural prowess. Wander through the ambient old fish market and the gorgeous city gardens then pleasure your palate with Spanish specialties in a local tapas bar (own expense). Bid farewell to your guide then return to your cruise ship well in advance of its departure. Worry-free Shore Excursion:We will ensure your timely return to the Palma de Mallorca port for this activity. In the rare event your ship has departed, we will arrange for transportation to the next port-of-call. If your ship is delayed and you are unable to attend this activity, your money will be refunded. See our terms and conditions for full details.